I think when I heard the first advertisement for this they marketed it as "the original Harold & Kumar" which I found amusing. For those of you that haven't heard, Cheech & Chong are getting back together. This has been the year of comebacks: Spice Girls, New Kids on the Block, now Cheech & Chong. Anyhoo, the duo will be performing in Boston on Friday, Dec 12th at the Orpheum and pre-sale tickets go on sale tomorrow morning Thurday 8/7 at 10am EST. The pre-sale only lasts 12 hours, and ends at 10pm tomorrow night, so get your tickets fast. After the presale ends, tickets go on sale to the public on Fri, Aug 8 at 4:20pm. 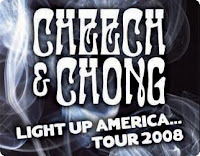 0 Response to "Cheech & Chong Light Up America Presale - 8/7"